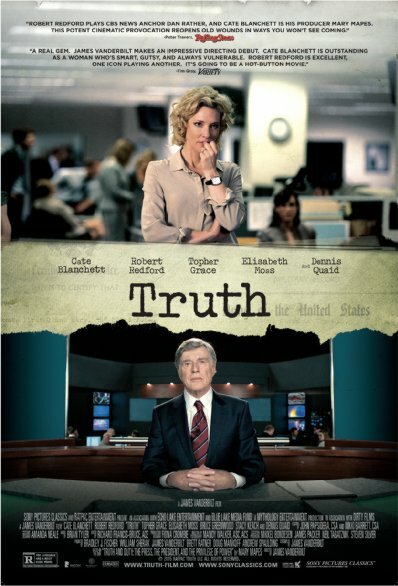 Truth is the directorial debut of James Vanderbilt, a screenwriter whose best known for writing David Fincher’s Zodiac. Truth also tells the story of the infamous 60 Minutes story of how then-President George W. Bush had used his connections to dodge the Vietnam War and received special treatment during his time in the National Guard. The story, along with the people involved with the film both behind and in front of the camera, made Truth a must-see during a very crowded fall movie schedule. While Truth features some great performances from Cate Blanchett and Robert Redford, the film ultimately falls flat, and turns one of the most fascinating stories of the past 15 years into a bit of a Hollywood-ized mess. Here’s the review of Truth. Blanchett plays Mary Mapes, producer for CBS News and 60 Minutes. The year is 2004, and Mapes along with her frequent collaborator, CBS News Anchor Dan Rather (Redford), are coming off a very successful story involving the Abu Ghraib prison in Iraq. Their next story involves George W. Bush in his time in the National Guard, and how political influences like then-Lt. Governor of Texas Ben Barnes helped him get into the Guard, instead of going to Vietnam. As CBS airs the piece, it begins to blow up in their face. Allegations of false documentation, forgery, political motives/agendas, and so on. The story becomes a P.R. nightmare for CBS News, with the fallout being the resignation of Dan Rather, Mary Mapes’ firing, and so on. The film is based on Mapes’ book, Truth and Duty, a book which I feel would be a more fascinating read than this film. The biggest problem with Truth is that it doesn’t feel as genuine or real as it could be. This story has fascinated me for years now, partly due to my growing up in the Texas political scene around this time, and the other being my love and admiration of Dan Rather, both as a person and as a journalist. I just feel like Vanderbilt put a lot of sweat and tears into the film, but it doesn’t quite translate to the film. You never feel anything for these characters, which you should since the pain of the real Mary Mapes and Dan Rather for how the government and their own company screwed them over because it was an election year is still very real. If the film were either a made-for-tv film (which it feels like it at times), I may be a little bit kinder. Or maybe this story could’ve worked as a documentary, with Mapes, Rather, Barnes, and everybody involved in this story telling it like it was. One of the reasons I didn’t hate Truth was for the performances. Cate Blanchett is always terrific in whatever she does, and Robert Redford is great as Dan Rather, even if his screen-time is limited. Dennis Quaid, Elizabeth Moss, and Topher Grace portray members of the news team tasked with investigating this story, and they all do fine work in their respected roles. Bruce Greenwood plays then-President of CBS News Andrew Heyward, and is always great even if he’s barely in the film until the third act, and Stacey Keach does fine work as Bill Burkett, the source Mapes and her team used to uncover the documents that proved that Bush had dodged Vietnam. There was one performance that was incredibly distracting in the film, and it was the actor who played Barnes in the film. It was a minor role, but the character felt like a cartoon character instead of an actual human being. Truth also felt like it was possibly 15-20 minutes too long. Even though the film runs a little over two hours, you definitely feel it as the film drags on and on. It’s a shame since I’m usually a sucker for dramas like Truth, especially dramas involving journalism (which is why I can’t wait to see Spotlight). To sum it all up, Truth is one of the more disappointing films of 2015. A story that I’ve been fascinated with since I was a kid (I was a weird kid) is turned into a dull and lifeless soap opera that lacks the excitement of what really happend. Although I am happy that I saw Truth, because it makes me want to go out and find Mary Mapes’ memoir, which as I mentioned earlier is probably a much more compelling and exciting account of this story than Truth. Hopefully I’ll be seeing a much better true story about journalism in Tom McCarthy’s Spotlight this week.